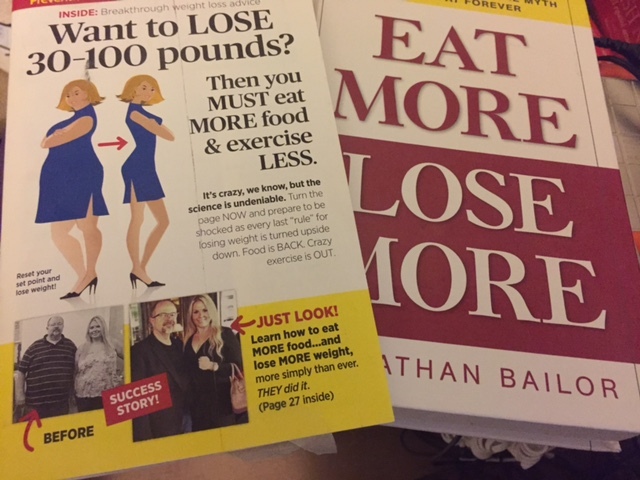 Originally, I got a mailer from Rodale for a book called Eat More Lose More by Jonathan Bailor. 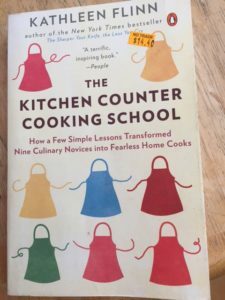 I found it used on Amazon and it’s been an interesting read. I should note that in the copyright area, it states that it was published as The Smarter Science of Slim by Aavia Publishing in 2012 and The Calorie Myth in 2104. Since most of us would find it on Amazon as The Calorie Myth, I’ll continue to refer to it as that. But the book is the same. Mr Bailor is a nutrition researcher and wellness entrepreneur. His passion for helping people does come through in his writing. The first fifteen chapters (or 138 pages in my hardbound book) deal with the problem of obesity in the United States. He claims it goes back to January 14, 1977 when the government issued Dietary Goals for American. After that, obesity skyrocketed. Let’s be honest. People made fun of Atkins because it called for 65% of the diet to be fat. Well the Food Pyramid in 1977 called for 65% of the diet to be carbohydrates without mentioning what kinds. So what really is a balanced diet? I have to confess. I used to be an electrical engineer. I used to believe that all calories were the same. After all, energy is energy, right? Even after I saw the light, I couldn’t convince my own father…another electrical engineer. Anyway, if you’re also a nerd, yes, energy in and energy out and all. But, calories get burned differently. That’s where we’ve been making our mistakes. We assume that if we eat 100 calories of a cookie, it’s going to be the same as 100 calories of raw vegetables. But think about it. How much more energy does it take to eat the darn vegetables than it does the cookie? And do we feel satisfied? We need to embrace fat to feel satisfied after a meal. You actually eat less when you’re feeling full. My main message from this blog has been to avoid anything that cuts out a single food. I don’t trust those kinds of diets since I don’t think they’re sustainable. 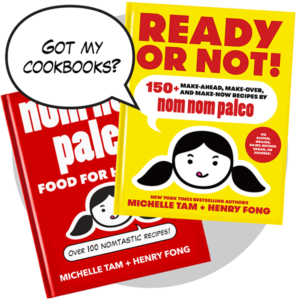 So I like this book in that it talks about the healthy fats and good proteins. Mr. Bailor has come up with an acronym to help you choose what to eat. I confess to learning a lot about how food is processed in the body. I have insulin resistance and am looking for that single key that will heal me. The truth is it’s a process of putting in the right stuff and eliminating the bad stuff. I also really loved learning about the idea of a “naturally” thin person and remember back when I was eating more simply. I’d heard about the “set point” theory of weight. Mr. Bailor talks about resetting your set point, and it makes sense to me. You’re just unclogging the drain. This is where I disagree with Mr. Bailor. I was reading about how our natural hormones change as we lose muscle mass. I think it’s essential that we do regular weight training to maintain our muscles, if not build them back up. And I don’t think 20 minutes a week is going to do that. I think The Calorie Myth is a worthwhile read if you’re interested in the biology and physiology and how calories are processed at the cellular level. There’s a great list of substitutions…I learned a few good tips. 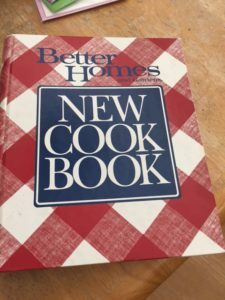 The recipes and five week plan are OK. I don’t think it’s anything earth-shattering. I’m not thrilled he suggests Xylitol for sweetener. I prefer stevia. But, what I do love about the recipes is that there are SANE options and the SANEist options. So you can see where there’s wiggle room.